In order to foster an environment of openness and collaboration, GWL Realty Advisors has united their three Toronto locations under one roof. figure3 were engaged by GWL Realty Advisors to create the design for their offices located in Toronto, Canada. GWL RA was looking to consolidate three offices into one new location at 33 Yonge Street in Toronto. This new 36,000 square foot space needed to represent GWL RA’s corporate vision, be unique and engaging, as well as a highly desirable place for their staff to come together. Crucial to the success of the new office was improving communication and collaboration among staff (as many of the employees worked in different sectors and had never met before), as well as fostering a culture of openness and transparency. The large floor plate with split core and large atrium at the centre had its advantages and disadvantages in trying to achieve GWL RA’s objective of connecting their people, as the building naturally encouraged office planning to the perimeter. figure3 doesn’t believe in rushing to design, so took the time to work with GWL RA on an immersive discovery process to uncover what they needed from their new headquarters. Participants from each of the three offices were asked to consider their current office culture, future desired state, and goals for the project. The sessions were top line, open forum discussions in an unhindered, blue sky environment that figure3 could translate into a concept for the space. Unlike most other tenants in the building, figure3 purposefully avoided building walls to block off the open atrium, but yet take advantage of the base building atrium skylight, the sound of the waterfall below and the expansive sight lines. The overall approach was to create a natural and youthful environment, highlighting a contemporary, light and bright neutral background with pops of strong color, and an emphasis on sophisticated detailing. Celebrating both the community and the individual was important, which would be achieved through careful attention to planning, including unique furniture selections, materials and accent pieces that provided character. The right to light, LEED initiatives and references to nature were also driving themes. These were interpreted through transitional ceiling details, replacing confining office walls with clear glass to allow for consistent views to outside space, wayfinding through flooring materials that delineated space and pathways, and nature inspired materials which can be seen in the carpeting, use of raw concrete, wood, and moss. Leading with openness right from the elevator, staff and guests arrive at a crisp and modern reception area flooded with natural light from the open atrium at the centre of the building. 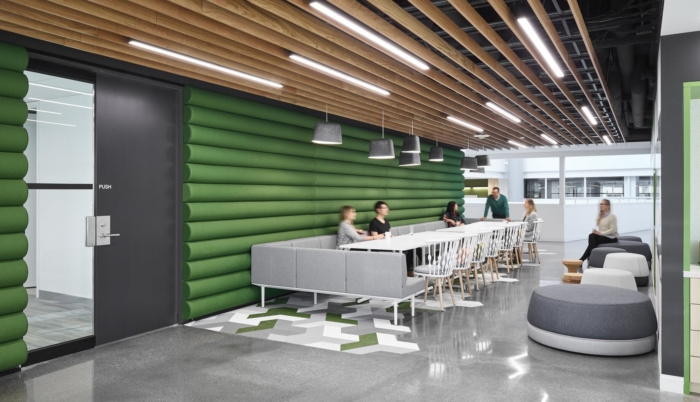 The highlight of the space is the engaging desk that draws guests in with its biophilic accents and which organically transitions to a seating area. Sightlines are expansive and allow views into a variety of connection points. figure3 placed the reception, conference room, lunchroom and serveries adjacent to the central pathway through the atrium connecting all business units. Four color-coded interactive collision hubs were created to encourage collaboration, with formal and informal meeting areas, and private rooms also strategically placed throughout the office. In addition, the new space boasts 16 meeting rooms with upgraded technology that supported state of the art conferencing and presentation provisions.